LADY G is a beautiful example of the very successful Talaria 48 Motoryachts. Her Michael Peters designed hull provides a safe, comfortable dry ride and her JetStick® control system allows fingertip control maneuvering in and out of dock. *Easily seen, courtesy showings available. United Yacht Sales New Jersey would love to guide you through a personal showing of this 48' Hinckley Talaria 48 My 2013. 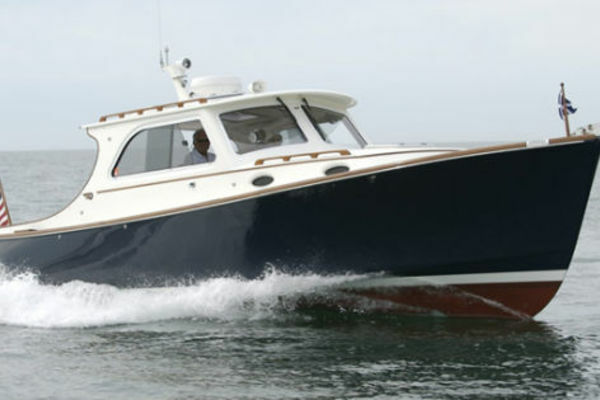 This yacht for sale is located in Boothbay Harbor, Maine and priced at $1,950,000. For a showing please contact us by filling out the form on this page and we will get back to you shortly! LADY G has been professionally managed and maintained by Hinckley Service since new and is in excellent condition. She was built by an experienced owner and is highly optioned, featuring larger 800 hp engines and a hydraulic swim platform for dinghy storage or easy access to the water. LADY G has been lightly used and is in the water ready for her next owner. The hull is built using Hinckley DualGuard™ Composite Construction- Kevlar®/E-glass outer skin. Corecell “M Foam” for core above and below the waterline. Carbon fiber inner skin. Laminated with Vinylester resin using Seaman Composite Resin Infusion Molding Process (SCRIMP®). The deck is built with E-glass outer and inner skin with Corecell ”M Foam” for core. Laminated with Vinylester resin using Seaman Composite Resin Infusion Molding Process (SCRIMP®). Non-metallic composite thru-hull fittings with ball valve seacocks are below the waterline and above the waterline where appropriate. Bronze seacocks, thru-hull fittings and sea strainers on propulsion engines. Hydraulic adjustable Swim platform is painted to match hull color with teak decking inserts and stainless steel half round with a stainless steel telescoping 3-step swim ladder under swim platform. Ocean LED underwater lights mounted under swim platform. Varnished teak handrails are mounted on forward cabin top, port and starboard on pilothouse roof and along the aft end of pilothouse. Anchor Locker: Molded into the foredeck, with hinged and gas-spring assisted hatch. Custom fold-outstainless steel anchor roller with stainless steel anchor. Remote control for anchor windlass as well as control at helm station makes anchoring simple. Custom fresh water spigot located in cockpit. Chocks - (2) Open custom Hinckley stainless steel bow chocks, and (4) Closed custom Hinckley chocks. (10) Smoke gray tint hatches with stainless steel frames have SkyScreen screens and blinds. Custom sunpad on trunk cabin top forward of pilothouse with stamoid cover for sunbathing underway or at rest. The large Cockpit provides comfortable exterior social space. Entry to the cockpit is either from the side coaming gates or through the transom door to the swim platform. Molded fiberglass boarding steps inboard of cockpit coaming gates port and starboard. A transom door to starboard for easy access to the swim platform. Custom fresh water wash down spigot in cockpit. Seating: Fiberglass “L” settee to port and double seat to starboard with storage inside accessed through gasketed fiberglass lids. Sliding curved stainless and glass aft pilothouse doors open to combine the cockpit and pilothouse spaces or slide closed to provide protection from the elements while still providing excellent visibility and natural light. Custom Scandvik polished stainless steel table base in pilothouse with electric up/down for dining, cocktail, or berth positions. Three forward fixed windows with windshield wipers & washers and fully concealed stainless steel frame. Three heavy-duty electric self-parking wipers on the pilothouse windows, with intermittent wiper controls and fresh water windshield washers. Ocean Air Skysol pleated blind system for side windows. Front windows have outside snap-on Ivory Stamoid® covers. Pilothouse aft door roman blinds for privacy or shade. Retractable 26” LED HD TV built into the forward end of the settee to allow easy viewing throughout the pilothouse and is completely concealed when entertaining guests. HELM area: The Helm is forward to starboard and has a satin varnished dash and outboard shelf where electronics are mounted. The area is also home to the Hinckley JetStick, engine controls, navigation instruments and gauges, and a teak rimmed steering wheel. Two Stidd helm seats finished in Ivory Ultraleather, with full power upgrades for up/down and fore/aft movement. Helm seats are mounted on chrome Stidd seat bases. JetStick® II system includes the Hinckley PalmStick wireless remote JetStick system. The helm has an open view into the easily accessed galley below as well as the surrounding deck and area outside the yacht. Dual Raymarine e165 multifunction displays with hybrid touch technology. From the pilothouse forward, down the open companionway are steps to the interior accommodations: The boat’s 15’5” beam provides for spacious accommodations including comfortable pilothouse area, open Galley, Aft Cabin with twin bunks, two full Heads, and luxurious Master Suite with center line queen bunk. The interior is satin varnished cherry with sound absorbent overheads with varnished cherry battens, and a varnished teak and tulip cabin sole. Removable protective covers are provided for cabin soles. Custom interior door provide a minimum of 6’2” of head room clearance. Ten (10) low profile Stainless Steel framed opening hatches provide a light and airy interior. Four (4) oversized powered open/close hatches on pilothouse top. GALLEY (Port): This area is open to the pilothouse and receives lots of natural light and ventilation and also has a portlight over the counter. Custom Juperana Tier Ivory polished Granite countertop in galley with cut-outs for sink, dry storage cooktop and freezer. Sharp combination Stainless steel microwave/convection oven in locker above counter. U-Line Combo refrigerator drawer unit, both drawers finish with cherry-faces. Freezer – Top loading custom stainless steel box with Seafrost wrap around condensing freezer plates. Comfortable twin bunk layout with ample storage built into each bunk accessed by drawers under the bunk. Twin shear lockers above the starboard bunk. Sealand Vacu-flush marine toilet plumbed directly to 35-gallon holding tank. The holding tank can then be emptied via a deck fitting or overboard through the Sealand macerator pump to a discharge facility. Storage areas are outboard of sink and shower. Full length dressing mirror mounted on back of guest cabin door to head. Mirror mounted on bulkhead aft of sink. MASTER SUITE (Forward) The Master Suite is luxurious and very well appointed. It includes a private head with separate stall shower. Entered through a starboard solid cherry door, Owner’s stateroom has a centerline aft-facing queen bunk with storage drawers under. The bunk is an innerspring mattress. Full length dressing mirror mounted on the back of the head door. Start Batteries: Two (2) Lifeline 4D AGM batteries for main engines and generator. House: Four (4) Lifeline 8D AGM batteries for the main house bank. Two (2) alternators - 80-amp 24-Volt DC, one per engine. Generator: One (1) Onan 13.5-KW, rated for 240-volts AC and is mounted in a sound shield. Remote panel for starting with gauges. Hinckley JetStick® II system-integrates forward and aft motion of boat, steering, and bow thruster into single joystick. (2) Automatic 24-volt DC sump pumps for showers, washing machine and air-conditioning condensate. (3) Rule® 24-volt DC electric 3700-GPH bilge pumps with ULTRA automatic float switches. Chilled water system; dual chillers and circulation pumps with four air handlers with three independent controlled zones; Zone 1: one 12KBTU unit in Master Suite; Zone 2: one 12KBTU unit in Guest Suite; Zone 3: two 16 KBTU units in the Salon. Engine Room Insulation: Insulated with foam/composite insulation with double gaskets on access door to engine room. 60-lb Quickline Ultra primary anchor with 30’ x 3/8” Grade 40 galvanized chain + 200’ x ¾” three-strand nylon rode. One ensign, stern mounted 5’ varnished teak staff with flush socket accompanied by flag.